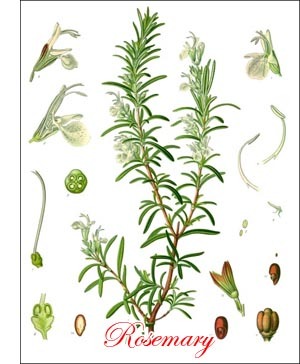 Rosemary (Rosemarinus officinalis, Linn.) As its generic name implies, rosemary is a native herb of seacoasts, "rose" coming from Ros, dew, and "Mary" from marinus, ocean. It is one of the many Labiatae found wild in limy situations along the Mediterranean coast. In ancient times many and varied virtues were ascribed to the herb, hence its "officinalis" or medical name, perhaps also the belief that where rosemary flourishes, the lady rules!". Pliny, Dioscorides and Galin all write about it. It was cultivated by the Spaniards in the 13th century, and from the 15th to the i8th century was popular as a condiment with salt meats, but has since declined in popularity, until now it is used for seasoning almost exclusively in Italian, French, Spanish and German cookery. The plant is a half-hardy evergreen, 2 feet or more tall. The erect, branching, woody stems bear a profusion of little obtuse, linear leaves, green above and hoary white beneath. On their upper parts they bear pale blue, axillary flowers in leafy clusters. The light-brown seeds, white where they were attached to the plant, will germinate even when four years old. All parts of the plant are fragrant - "the humble rosemary whose sweets so thanklessly are shed to scent the desert" (Thomas Moore). One of the pleasing superstitions connected with this plant is that it strengthens the memory. Thus it has become the emblem of remembrance and fidelity. Hence the origin of the old custom of wearing it at weddings in many parts of Europe. Hamlet Act iv, Scene 5. Rosemary is easily propagated by means of cuttings, root division and layers in early spring, but is most frequently multiplied by seed. It does best in rat her poor, light soil, especially if limy. The seed is either sown in drills 18 to 24 inches apart or in checks 2 feet asunder each way, half a dozen seeds being dropped in each "hill". Sometimes the seedbed method is employed, the seed being sown either under glass or in the open ground and the seedlings transplanted. Cultivation consists in keeping the soil loose and open and free from weeds. No special directions are necessary as to curing. In frostless sections, and even where protected by buildings, fences, etc., in moderate climates, the plants will continue to thrive for years. The tender leaves and stems and the flowers are used for flavoring stews, fish and meat sauces, but are not widely popular in America. Our foreign-born population, however, uses it somewhat. In France large quantities, both cultivated and wild, are used for distilling the oil of rosemary, a colorless or yellowish liquid suggesting camphor, but even more pleasant. This oil is extensively used in perfuming soaps, but more especially in the manufacture of eau de cologne, Hungary water and other perfumes.